Arthroscopic Rotator Cuff Repair is a surgical procedure used to inspect and reattach torn tendons of the rotator cuff. This minimally invasive surgery is performed through three or four small nick incisions around the shoulder, and avoids larger incisions. The supraspinatus tendon is the most commonly torn tendon. The subscapularis tendon is the tendon that attaches in the front of the ball of the humerus and rotates the arm inward. The infraspinatus and the teres minor attach to the back of the ball of the humerus and rotate the arm outwards. Together, the tendons of the rotator cuff act to keep the ball of the humerus in the socket and raise and rotate the arm. Rotator Cuff Tears can increase in size with time. Tears may range from small and partial in an elite throwing athlete to massive and irreparable in an elderly patient. Arthroscopic rotator cuff repair is an outpatient surgical procedure. This means that the patient may go home the same day as the surgery or stay overnight. 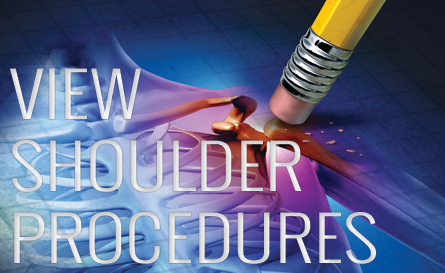 This procedure is used to inspect and reattach torn tendons of the shoulder’s rotator cuff. The minimally invasive surgery is performed through three or four tiny nick incisions around the shoulder. It replaces the need for larger incisions, although sometimes larger incisions are necessary. Anchors are placed inside the bone. Special suturing techniques are utilized to reattach the torn tendon back to where it belongs. This animation shows a repair of the supraspinatus tendon (attaching on top of the ball). 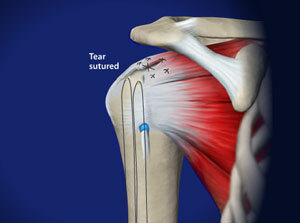 Tears to the other tendons of the rotator cuff can be treated in a similar way. After the repair, the patient is placed in a shoulder immobilizer or a sling and pillow. Proper rehabilitation is very important after rotator cuff repair. Physical therapy is required. Adherence to the rehabilitation protocol is necessary to maximize the results of the surgery. When Is Arthroscopic Rotator Cuff Repair Recommended? Your orthopedic surgeon may ask you to see your primary doctor to make sure that you do not have any medical problems that need to be addressed before your surgery. Blood tests, an electrocardiogram, or chest x-ray may be needed to safely perform your surgery. If you have certain health risks, a more extensive evaluation may be necessary before your surgery. Be sure to inform your orthopedic surgeon of any medications or supplements that you take. You may need to stop taking some of these prior to surgery.